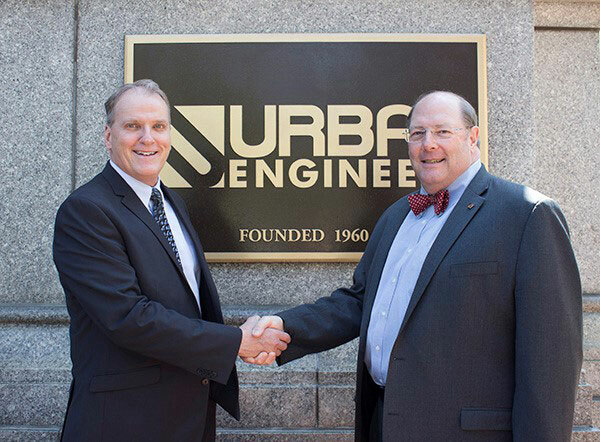 Erie, Pa. — Urban Engineers announced that William “Bill” Petit, PE, will succeed George H. Willis, PE, as vice president and office manager of the firm’s Erie office, effective this month. Willis, who currently serves as senior vice president and office manager, will be retiring after 43 years. He will continue to provide counsel over the period of transition. This completes Urban’s second leadership transition in Erie since opening the office in 1969. Petit and Willis have been peers in the industry since the mid-1980s as their careers developed in parallel organizations. During Petit’s career at PennDOT District 1-0, he gained experience in all of the departments at the agency. He rapidly progressed from civil engineer-1 through leadership in the design, construction, and maintenance units, culminating in his role as the district executive. “I am excited to join the Urban team, bringing more than 35 years of experience with many similar clients and customers to the firm,” Petit said. Petit is a graduate of Clarkson University with a Bachelor of Science in civil engineering. He continued his education while working for PennDOT to achieve a Master of Business Administration from Gannon University. He is a registered Professional Engineer in Pennsylvania and New York.